ooVoo Free PC Calls to USA and Canada : Computer App or Web Video Call | Free Pc to Phone Calls, Free Voip Calls to India International ! Video Calling from PC is getting very popular. Earlier it was very few services which were offering PC to mobile video calling (Skype was one of few), however new companies are coming into the market. One such service which is also being called as Skype Killer (in the category of video calling) is ooVoo. About a month back, we blogged about ooVoo and its features and the service was just loved by so many people. Apart from usual video calling, you can also use ooVoo to make calls to normal mobiles and landline phones. Infact, ooVoo is currently running a promotion where they are giving free calls to USA and Canada. First they were giving 120 minutes free calls to USA, Canada, now they have extended their offer to 500 minutes, but they mentioned that it will be till 1st April. Actually they are offering free oovoo credits which can be used to make free calls. Today is 9th April, but their cool offer is still valid. Instead they have extended their offer to 1st May '08. Moreover they are now giving 500 Free Minutes of free calls to USA, and Canada. I guess with such a stiff competition around in this voip industry, voip providers are bound to give such offers in order to sustain this competition. So, all those who want to talk to their friends and relatives living in USA, Canada, this is a great offer. You need not to pay even a penny. Call USA or Canada from your PC absolutely free, download their softphone and register for an account. They will get 500 minutes of free calling. FREE calls from ooVoo to a landline or mobile phone in the USA or Canada. Introductory period includes up to 500 minutes of FREE phone calls. FREE phone calls to the USA and Canada available through May 1, 2008. Update : The promotion is no longer valid and has expired! - Free 12-way video calling/chat for you and your friends. 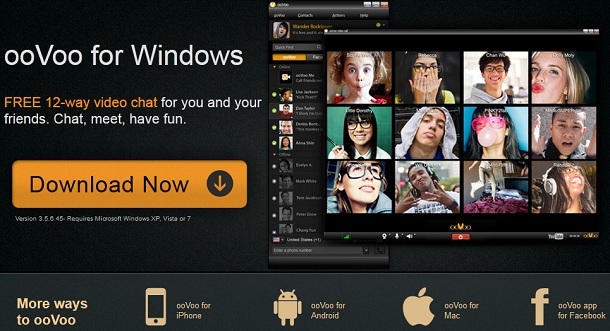 You can use ooVoo on your PC and your friends may be using ooVoo on their mobile or PC. All of you (in total 12 people) can video chat with each other for free! Its quite a unique feature offered by ooVoo. Let us say, you are using ooVoo softphone on your PC, but your friend is not using this app on his PC. Now what, you can either ask your friend to download the app and you two can video chat. A more easy way is that you provide him with a link and he can just open the link in browser and you two can video chat with each other for free. Absolutely no download is required. You can share the link with many people and do a conference call. With ooVoo, you can Web Call anyone using your personal web call link. Post it to Facebook, Twitter, or send it in an email or IM. No download is required; simply post your group video call link to the people you want to see. In a single click, your friend can join you in a live video chat. Just click Web Call in your contact list or if you are in a video call, click Add to Call and select Call Me Link to send a personal link to call you. After they (person you send the link) click on your link, they will be prompted to install ooVoo and then they can call you and join your video chat.